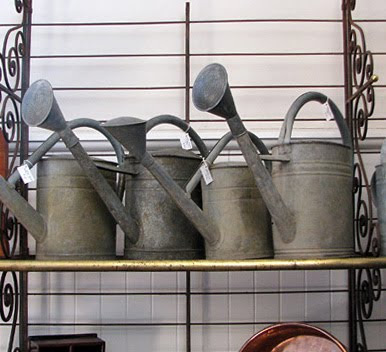 The Drill Hall Emporium: find Vogue living & Zoe Hoare Hamptons style in our store! find Vogue living & Zoe Hoare Hamptons style in our store! 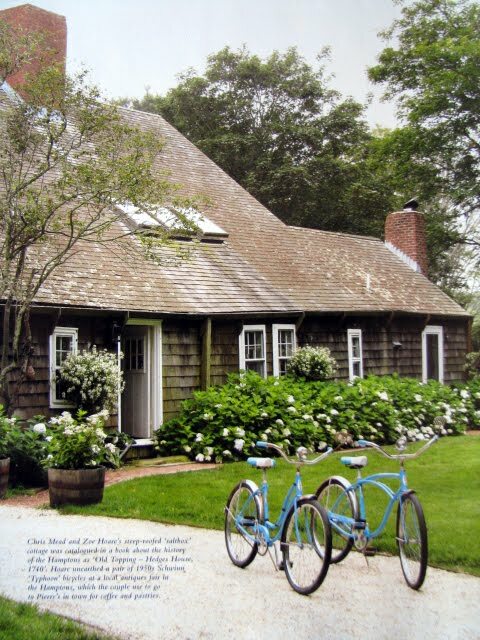 Zoe Hoare, Australian expat and daughter of renowned London antique dealer Appley Hoare now lives in this gorgeous cottage in the Hamptons. She found this pair of 1950s bikes at a local antiques fair in the Hamptons, just one example of her keen eye for unique treasures! She displays her antiques with flair. 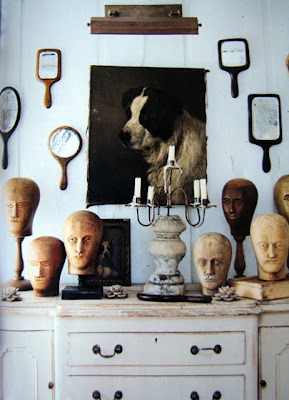 These are French milliner's heads, similar to ones that I showed in a previous post, on an antique dresser. 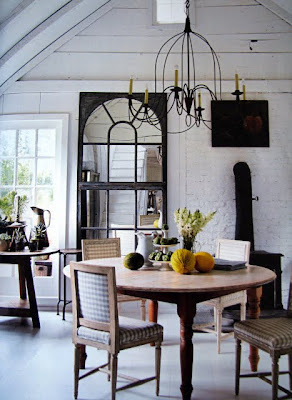 She has an amazing arched window mirror in her dining room. The chandelier is wonderful, too. 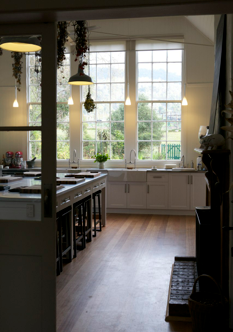 What a light and airy space, the peaked ceiling painted white is stunning. 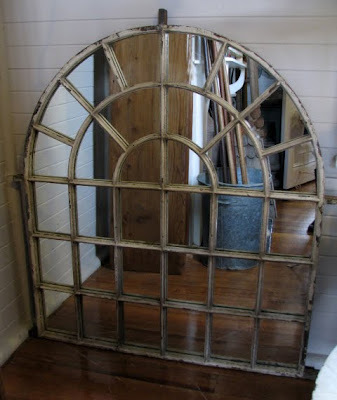 This is a rare French iron arched window mirror that we have in the store at the moment. It is currently in the garden room as I can imagine it on a courtyard wall. But it would look equally as good in a dining room as Zoe has shown. ...all available in our store! 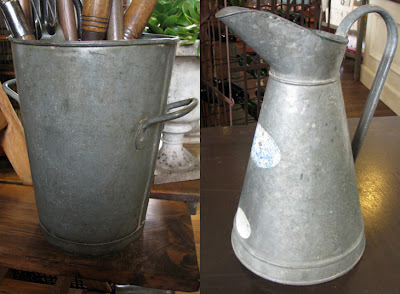 Again, available in our store! 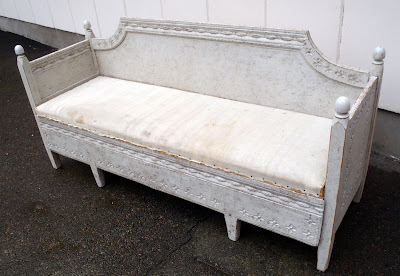 The only difference is our settee is an 18th century version, Zoe's is a reproduction available from her partner, Chris Mead's store, English Country Antiques. 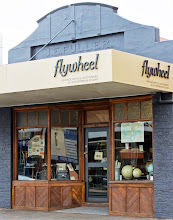 To visit his store, click here. Well, in actual fact, our settee is still in storage. We bought it on our buying trip earlier in the year but we have not had room for it in our store as yet. It is soon to take prime position, however! 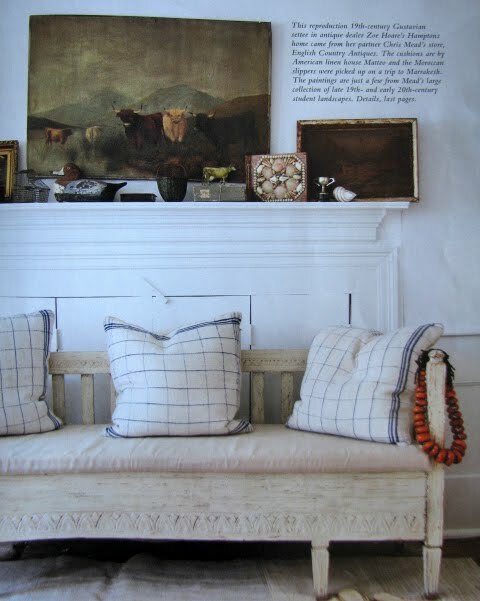 Barnacles and simple cushions are very relaxed Hamptons style, I think. 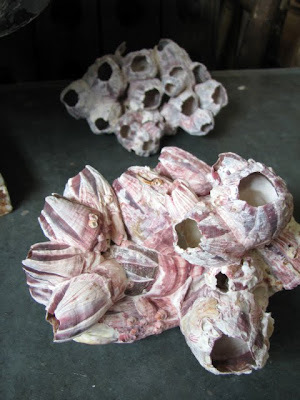 We only have two barnacle clumps left in store, they make great decorator items. 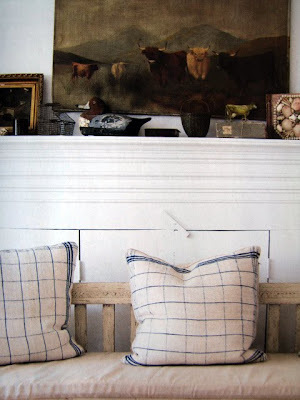 We will be adding checked linen cushions to our range shortly, in addition to our grainsack striped pillows (above). 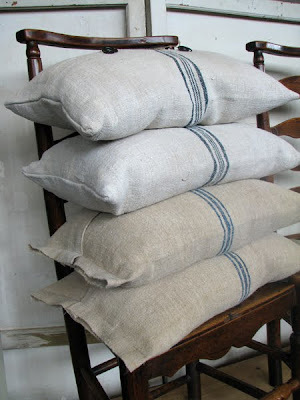 We have acquired some lovely antique French linen of a similar design to Zoe's cushions. Watch this space! And the decoy duck on Zoe's shelf above the Gustavian settee? A very similar model is currently in our garden room. 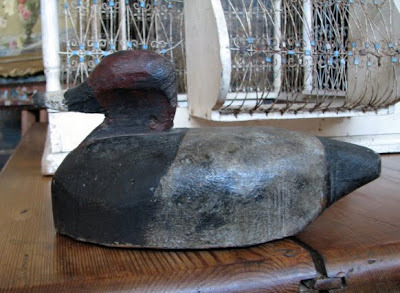 These decoy ducks ooze with character and charm. 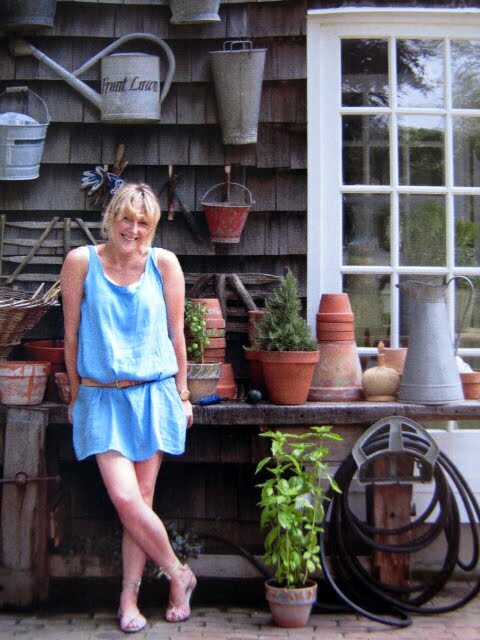 Do you like Zoe Hoare's relaxed style? We certainly do. (For the full article on Zoe Hoare's Hamptons cottage, see Vogue Living Australia, Nov/Dec pages 142 - 151). Yes, I'm with you as those checkered cushions on the settee caught my eye too. Will have to keep my eyes open when you show them on your blog! I really loved their lounge room too. 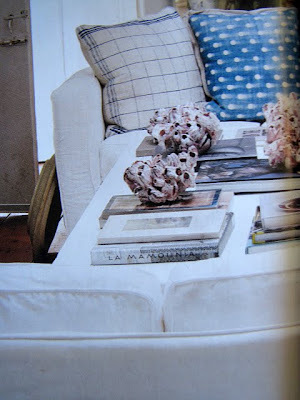 I am crazy about slip-covered furniture and hopefully one day my lounge room will have a slip-covered couch. Anyway, loved the side table with the lamps and the bleached antlers and that huge wooden dough bowl (?) underneath. Am also crazy about the floor lamp near the two couches. Don't think it would hurt the local light shop here to stock something like that, they only seem to stock modern ugly stuff....now before I leave that room noticed the french milliners heads too, and instantly thought of what you featured on your blog not so long ago. Tammy you are ahead of your time!!!! Gosh, I am glad that your comment didn't get lost in cyberspace as well! I always select a long message and copy it beforehand to ensure that you can paste it if need be, if this makes sense? I have had many comments and emails go missing in no-man's-land too.